I first met Will, owner of It All Started Here, back in 2015 in Cardiff. We met up again at the Glasgow Coffee Festival later that year and have stayed in touch (on and off) ever since. Back then, Will combined a day job with running stalls markets/pop-ups over the weekends, serving coffee from Sheffield’s Foundry Coffee Roasters to the good people of Glasgow. Last year he extended that principle when he opened his first coffee shop on Glasgow’s south side, It All Started Here opening on Friday, Saturday and Sunday. Sadly, when I came up for last year’s Glasgow Coffee Festival, I came up on the weekend and left myself Monday for exploring, so missed out. Therefore, for this year’s festival, I made a point of going up on Thursday night on the Caledonian Sleeper and heading over to It All Started Here on Friday. It All Started Here is a multi-roaster, with a different roaster from around the UK on espresso and batch-brew every week. There’s also a brunch menu and a lovely selection of cakes. Even better, starting this week, It All Started here is now open six days a week, Tuesday to Sunday. On a quiet, residential street which runs parallel to the busy Kilmarnock Road, the square, grey-painted façade of It All Started Here stands out from the sandstone terrace, with a large, square window on the right, door to the left. North-facing, there’s plenty of shade for the large, chipboard table on the broad pavement, the relative lack of traffic making it the ideal outside spot. Inside, the layout is equally modest. There’s a three-seat window-bar with high stools and two two-person tables with low, round stools against the right-hand wall between window and counter. The counter dominates the space, occupying most of the back on the right-hand side, with the espresso machine at the front. There’s just enough space for you to file past on the left, which is where you order, the till surrounded by a tempting array of cakes, the simple drinks menu on the wall to the right as you stand at the till. The reason for counter’s size is readily apparent from here. It All Started Here has a small brunch menu, with all the food being prepared in the space behind the counter. It All Started Here has one more surprise. Past the retail shelves, lined with bags of coffee from the previous weeks’ roasters (a who’s who of top British roasters), is an opening on the left-hand side of the back wall, leading through to a small, cosy, windowless back room. There’s a two-person table on the left and a four-person table on the right, and that’s it. Both rooms have high ceilings, which contribute to a sense of space, while the back room, which could be claustrophobic, has a large mirror on the left-hand wall making it feel much bigger than it is. The two spaces are very different in character, with the front room filled with natural light from the window, helped by the wooden floorboards and white walls/ceiling. The back room, meanwhile, accentuates the lack of natural light with its dark grey walls. Square Mile was on the bar when I visited. Normally my heart would sink at this point, not because I don’t like Square Mile, but because I know its coffee really well and am always keen to try something new. 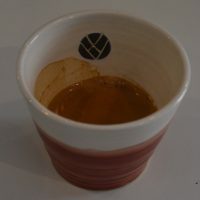 However, the Sweetshop blend was on espresso and, back when I was starting out with the Coffee Spot, I found Sweetshop, with its out-there fruity flavours, far too much to handle. The experience scarred me and I’ve avoided it ever since. Until now, that is. My palette has evolved, and I thought it was about time I laid this particular ghost to rest. The current incarnation of Sweetshop is a blend of a natural Brazilian with a washed Ethiopian and, playing it safe, I tried it as a flat white. It arrived at my table with a bottle of water and a glass, which was a nice touch. The coffee was even nicer: subtle but fruity, it went really well in milk. Intrigued, I decided to try it on its own (although partly it was because It All Started Here serves its espresso in some gorgeous Claire Henry Ceramics cups). Very different from how I remembered it, this was a more rounded, less extreme coffee, the fruity nature I’d detected in the flat white coming to the fore. Since I was there for lunch, I also had avocado on toast, with roasted peppers and a boiled egg on top. This too was excellent, with crispy toast, a lovely combination of peppers and avocado chunks with an excellent boiled egg, firm white, but runny yolk, providing the perfect combination. This entry was posted in Breakfast, Cafes, Cake, Glasgow, Laptop Friendly, Lunch, Retailers and tagged include by Brian Williams. Bookmark the permalink.